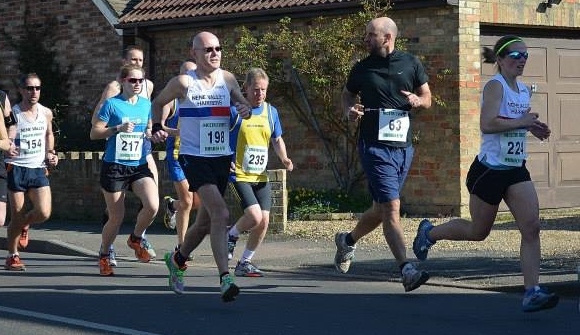 Hot, windy conditions and a relentlessly hilly course greeted a troop of Nene Valley Harriers who travelled to Offord, near St Neots, to take on the Hurden 9m and 18m races on Sunday March 16. Hot, windy conditions and a relentlessly hilly course greeted a troop of Nene Valley Harriers who travelled to Offord, near St Neots, to take on the Hurden 9m and 18m races on Sunday March 16. The Nice-Tri 18m event is popular with athletes preparing for spring marathons, while the 9m still offers a significant challenge with endless hills and strong head winds on the day. Lance Hemmings just missed out on a top ten position in the 18m race, finishing 11th in 2:00:03. Stamford Striders’ Jim Morris pipped him to the post of top V45 with an impressive time of 1:53:30, placing him 4th overall. Hemmings’ London marathon training partner, Olly Slater, just beat fellow Harrier Barry Warne, when they crossed the line in 15th and 16th in 2:07:51 and 2:08:14 respectively. Warne, who is also running the marathon on April 13, picked up the first V50 prize. Chris Mooney also placed highly in the double-lapped race, finishing 38th in 2:17. Ruth Jones completed a successful weekend of racing when she followed up her first lady position at the Cambridge parkrun on Saturday with a win in the 9m event the following day. Jones finished 9th overall in 62:51, exactly a minute and a half ahead of former team mate Yvonne Scarrott, who also finished first V45 and second female overall for Harborough AC. L to R: NVH athletes Chris Mooney, Barry Warne & Ruth Jones. Pic from Paul Homewood.